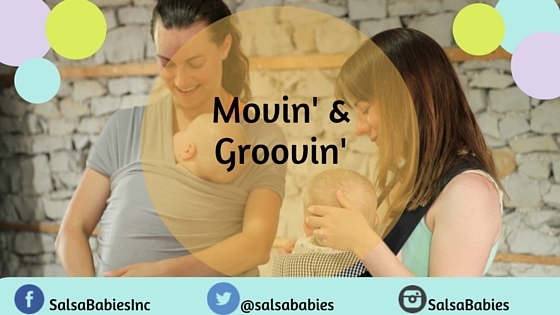 Movin' and Groovin' While Wearing Your Baby! You are ready to get moving while wearing your baby, but is there anything you have missed? Just as you check your car seat before you leave the hospital for that first trip, you should make a few checks before stepping into that first class. Is your baby secure in your carrier? Your carrier should be snug for your baby, but not too tight that they are uncomfortable. Your baby’s mouth and nose should remain free & clear from your carrier, any accessories and your body. Your baby’s neck ( even for older babies) should always be supported. It is important even for older babies, because they can’t anticipate your movements. If your carrier doesn’t provide adequate support for your babies neck, you can add support by rolling a receiving blanket into a “jelly roll” and threading it out the one side of your carrier, behind your baby’s neck and out the other side of your carrier. The method is important so that the blanket stays away from your baby’s face. International recommendations are that your baby should be facing inward. The optimal position for safe hip and spine positioning is one that inward carries allow for. The ” M ” position is one where your baby’s bum & legs make up the M shape. Your baby’s knees should be above their bum. To help prevent over stimulation. Babies can get easily get over stimulated anyways, but add in the extra stimulation from new moms to watch, new babies to check out, music, mirrors, maracas….there are lots of attention grabbing things in classes!. Your baby may easily find it all overwhelming if they were facing out. This is not all babies of course, but for some it can be too much. A great resource for positioning and all types of carrier support visit our friends at www.babywearinginternational.org. They have fantastic, free resources on their site.